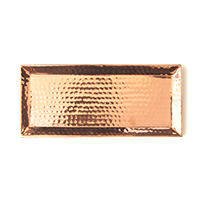 Rosy Rings Hammered Rose Gold Tray is a gorgeous tray that is designed to for Rosy Rings 3-Wick Brick Botanical Scented Candles. It has a hammered texture and finished in rose gold color. A beautiful way to display you Rosy Rings Botanical Brick Candle.